If you’re not satisfied with your brows, have a thin brow, or are constantly using pencil or brow fillers… microblading is a great long term solution! Microblading is a very natural option that delivers semi-permanent results. Unlike the sometimes Sharpie-esque effects of permanent makeup, microblading is more of an art to recreate thin, realistic hair patterns that look just like natural brow hairs. Micoblading can be used to fully reconstruct, define, thicken, and fill gaps, as well as over plucked brows. The process is simple with minimal to no pain, unlike tattooing. After a consultation, a removable pencil or marker is used to draw in a customized shape based on the client’s bone structure, hair growth pattern, and facial features. Before the actual microblading begins, a topical numbing cream is applied to the area to minimize discomfort, followed by a liquid anesthetic. Many clients are concerned about pain levels, but most describe the sensation as relatively painless with slight or minimal discomfort. The most difficult part of the procedure for the client is remaining still and seated for an extended period of time. The result last up to three years before beginning to fade, and can easily be maintained and retouched every few years. A one month follow up appointment is mandatory or suggested for retouching and to access how the skin is absorbing the pigment. The healing process is truly different for everyone, but it takes between 25 to 30 days for the brows to completely heal. 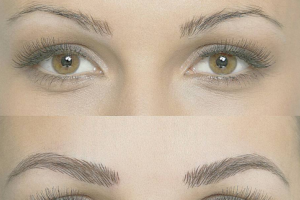 Unlike brow extensions, microblading maintenance is low. After healing, you can apply makeup as usual, rub them, immerse them in water… pretty much as if you’d never had the procedure. There is no special care required other than the recommended sunscreen. Waking up with totally perfect eyebrows with zero effort is well worth the time and money! Feel free to post questions in the comments.